The BMW i models include two cars that are both operated by electricity, but drivers can also include a gas gauge if they want to also use gasoline. The first vehicle in this lineup is the i3. The i3 looks like a two-door car, but it's actually a four-door car with doors that open up parallel to each other. Though this vehicle may look small, there is a lot of room inside. 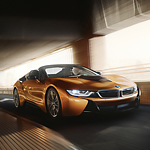 The i8 is a coupe vehicle. It is known for its tough engine and horsepower. It also has a navigation system, rearview camera, and many other gadgets that make this vehicle desirable. Both vehicles are made with a light metal frame. This is to help drivers get to where they're going in a hurry. This is also to help drivers feel more comfortable when on the highway or when traveling through winding roads.